You are currently browsing articles tagged New England. To those of our readers who are not ordained teaching elders, the setting aside of qualified men to the office of the ministry in our Presbytery meetings may indeed sound foreign. But in another sense, those who are not ordained and not attenders of your regional Presbytery meetings still have the written record of Holy Scripture, such as 1 Timothy 4:14 , where Paul wrote to young pastor Timothy and said, “Do not neglect the spiritual gift within you, which was bestowed on you through prophetic utterance with the laying on of hands by the presbytery.” (NASV) The laying on of the hands of the presbytery in our regional meetings have a biblical basis to them! It may indeed be a worthwhile day for you to attend as a layman or laywoman the proceedings of your local Presbytery some Saturday, or whenever they meet during the week. Visitors are welcome. Just talk to your pastor or a ruling elder for information on the next meeting. It will enable you to pray more for your church, see the work of the Spirit in other nearby churches, and realize anew the biblical basis for being a Presbyterian! Dr. Will Barker, former president of Covenant Theological Seminary and professor of church history at the Westminster Theological Seminary, Philadelphia, has written of “The Men and the Parties” that comprised the Westminster Assembly of Divines. The full text of this article can be found here: http://www.graceonlinelibrary.org/creeds-confessions/the-men-and-the-parties-by-william-s-barker/, but our post today focuses on the first portion of that article, where Dr. Barker provides a very helpful overview of the five groups which played a role in the history of this great Assembly. Discussions of the Assembly tend to focus on the different parties, often to the neglect of the great unity that existed among the members. It must never be forgotten that their first concern was for the gospel of Christ and for the unity of all who truly belong to him. One of the most beautiful chapters in the Confession, “Of the Communion of Saints”, begins: “All saints that are united to Jesus Christ their head by His Spirit and by faith have fellowship with Him…: (WCF XXVI/1). Further, as teachers they were all Calvinists in theology and could all be called Puritans, depending on the definition of that controversial term. The main controversy among them was church government and the related matter of church discipline, including the role of the state. The parties, therefore, are perceived along the lines of church polity: episcopalian, presbyterian, or congregationalist, with two additional categories being relevant – the Erastians and the Scottish delegation. All of the Westminster divines appointed by the Long Parliament in 1643 were ordained ministers in the Church of England, although many had refused to conform to some Anglican practices and some had temporarily gone into exile in the Netherlands. This means that they had entered the ministry in an episcopal system, and many still favored a moderate episcopacy. Men such as James Ussher, Archbishop of Armagh in Ireland, did not attend the Assembly because it did not have the approval of King Charles I. Others dropped out in the early stages. But all were opposed to prelacy, that is, the functioning of bishops like secular princes rather than as the teaching and preaching ministers of the New Testament. Some who favored a moderate episcopacy remained in the Assembly and were gradually persuaded to prefer the presbyterian position. The Presbyterians, who favored a system with parity of the clergy, but with a graded system of church courts so that local congregations were bonded together and in submission to a regional presbytery, and presbyteries were in submission to a national general assembly, were in the majority in the Assembly. They were of two persuasions, however: those who believed in presbyterianism by divine right – i.e., that it is the only system prescribed by the New Testament – and those who believed presbyterianism was simply the system most consistent with the principles of church government taught in the New Testament. The latter was the prevailing view among the English divines at Westminster. Those who favored congregational church government were led by a very able and vocal group that became known as “the five dissenting brethren.” These five had all gone into exile in the Netherlands in the 1630’s and had close relations with the congregationalists in New England. These were non-separating Puritans who wanted local church autonomy while still maintaining an association among churches and with the state. Although the Puritans of Massachusetts Bay enforced the New England congregational way through the civil magistrate, the English congregationalists were led by circumstances to prefer toleration. The Erastians, whose name is derived from a 16th-century Swiss theologian, were not in favor of any particular church polity – episcopal, presbyterian, or congregational – by divine right, but were mainly concerned that church discipline be finally carried out only with the approval of the state. This view was upheld in the Assembly by a small but learned group and was supported by many in Parliament, which had called the Assembly and whose approval was necessary for the implementation of the Assembly’s decisions. As a result of the Solemn League and Covenant, approved by the Scottish Parliament on August 17, 1643 and subscribed by the English Parliament and the members of the Westminster Assembly on September 25, four Scottish ministers joined the Assembly in September of 1643. These were not voting members but had the right to speak. In exchange for the assistance of the Scottish army to the Parliamentary forces in the Civil War against the King, the Solemn League and Covenant sought to bring the churches of England and Ireland into conformity to the Reformed religion in Scotland in doctrine, worship, discipline, and government. The Scottish commissioners, with almost a century of presbyterian history behind them, favored presbyterianism by divine right. Such were the parties that emerged as church government proved to be the most controversial issue in the Assembly. Again we should remember that all of the Westminster divines were Calvinists. As we look back to the Assembly with gratitude primarily for the setting forth of the Reformed faith in the Confession and Catechisms, we should celebrate the doctrinal unity which it had. Where there was diversity, there was also a spirit of accommodation on the part of many. Richard Baxter, a contemporary Puritan but not a member of the Assembly, had immense appreciation of its members and its accomplishments. He later commented that if all Episcopalians had been as Archbishop Ussher, all Presbyterians as Stephen Marshall (the great preacher of the Assembly), and Independents as Jeremiah Burroughs, the divisions of the church might soon have been healed. “The rise of Presbyterianism in Hanover (Virginia) is inseparably connected with what is known by tradition as Morris’ Reading House. This was the first of several buildings in that region, erected to accommodate those who were dissatisfied with the preaching of the parish incumbents, and anxious to enjoy the privilege of listening on the Sabbath to the reading of instructive and devotional works on religion. “The origin of this movement was somewhat singular. The people had, for the most part, never heard or seen a Presbyterian minister. But reports had reached them of revivals in Pennsylvania, New Jersey, and New England. A few leaves of Boston’s Fourfold State, in the possession of a Scotch woman, fell into the hands of a gentleman who was so affected by their perusal that he sent to England by the next ship to procure the entire work. The result of its perusal was his conversion. Another obtained possession of Luther on Galatians; he in like manner, was deeply affected, and ceased not to read and pray til he found his peace in Christ. “These persons, with two or three others—all heads of families—without previous counsel or conference, absented themselves at the same time from the worship of the Parish (e.g. Church of England) church. They were convinced that the gospel was not preached by the parish minister, and they deemed it inconsistent with their duty to attend upon his ministrations. Four of them were summoned on the same day and at the same place, to answer as to the proper offices for their delinquency. For the first time they here learned of their common views. Confronted in them by this unexpected coincidence, they thenceforth chose to subject themselves to the payment of the fines imposed by law rather than attend church where they felt that they could not profit. “They agreed at first to meet every Sabbath alternately at each other’s houses to read and pray. Soon their numbers increased. Curiosity attracted some, and religious anxiety affected others. The Scriptures, and Luther on Galatians were read. Afterward, a volume of Whitfield’s sermons fell into their hands. (Eventually since Morris’s home became too small for the attendance, a meeting house was built merely for the readings.) The result was that several were awakened and gave proof of genuine conversion. Mr Morris was invited to several houses, some of them at considerable distance, to read the sermons which had been so effective in his own neighborhood. Thus the interest that had been awakened spread abroad. “The dignitaries of the Established Church (of England) saw the parish churches deserted and took the alarm. . . . They invoked the strong arm of the law to restrain it. . . . The (leaders of the reading houses) were cited to appear before the Governor and Council. “Startled by the criminal accusation which was now directed toward them, . . . they had not even the name of a religious denomination under which to shelter their dissent. At length, recollecting that Luther, whose work occupied so much space in their public religious reading, was a noted Reformer, they declared themselves Lutherans. “But so it happened that, on the way to Williamsburg (Va.), one of the company, detained by a violent storm at a house on the road, fell in with an old volume on a dust covered shelf. Reading it to wile away the time, he took it with him with the owner’s permission. At Williamsburg, he and the others agreed that it expressed their own views. When they appeared before the Governor, they presented the volume to him. 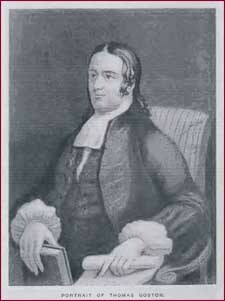 (A Scotsman), the Governor found it to be the Confession of Faith of the Presbyterian Church of Scotland. He then designated the men before him as Presbyterians, and dismissed them with the gentle caution not to excite disturbances. Who can deny that when the Spirit of God wishes to raise up a church for Himself, any means—even the mere reading of Scriptural sermons—will accomplish His ends? Of course in our day many might argue that we are past reading sermons or commentaries. But this author knows of one group of Christians who have together taken up the challenge to read Calvin’s Institutes, and meet weekly to discuss what they have read. Whether it is on electronic tablets or the taking up of books, profitable ends might be served by the Holy Spirit in the hearts of His people, much like this eighteenth century reading club which resulted in regeneration and sanctification for the early Presbyterians of Virginia. They didn’t even know what they were! It was the Governor of Virginia who designated them Presbyterians! Of course, the problem is that if you don’t believe the Gospel of salvation by grace through faith in Jesus Christ alone, then there really is no reason for going to the mission field, for you have no message. That hard reality was what was behind the reassessment issued in 1932 in the report known as Rethinking Missions. By the beginning of the twentieth century, modernism had made heavy inroads into the mainline Presbyterian Church, undercutting the cause of missions. Fewer missionaries were sent out as a result, and of those who did go, fewer still took the Gospel message with them. This was the problem pointed out by J. Gresham Machen that in turn led to the formation of the Independent Board for Presbyterian Foreign Missions (IBPFM). Today the PCA alone fields over 600 full-time missionaries, along with thousands of part-time and occasional missionaries. The OPC, ARP, RPCNA, and other conservative Presbyterian denominations do their part as well and with equal vigor, each in accord with their respective size and strength. And in all this, we all seek to lift of the Gospel of the Lord Jesus Christ, that God alone might be glorified and that He might sovereignly build His kingdom. Let this be a reminder to pray for your missionaries and to pray for those who train them, that by God’s grace all might remain true to the Word of God. This past Tuesday we wrote of the life and ministry of the Rev. Thomas Boston [1676-1732]. Today, through an address delivered by Dr. Alexander Whyte in 1902, we will examine closer a pivotal moment in the life of Boston, and by his actions, a moment of immense importance that has rippled down through the centuries. Dr. Whyte provides a wonderful introduction to the subject, and I think you will profit from the reading. A sermon preached before the Baptist Union on Wednesday, October 9th, at St. George’s United Free Church, Edinburgh (1902). “My soul shall be satisfied as with marrow and fatness.”—Psalm lxiii. 5. HE NOW PREACHED SIN, AND EVERYTHING ELSE, WITH FAR MORE SOLEMNITY, AND TENDERNESS, AND LOVE. 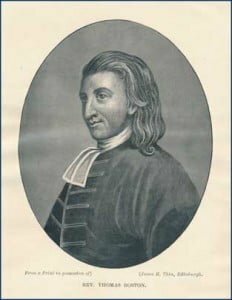 His whole pulpit and pastoral work took on from that time an entirely new earnestness, an entirely new scripturalness, richness, inwardness, and depth, all of which was as new and as sweet to Boston himself as it was to his spiritually-minded people. Wherever Boston went to preach, and he was now more than ever sought after for communion seasons all over the south of Scotland, a special blessing went everywhere with him. And when any of his brethren ventured to remark on the new power of his preaching, Boston immediately attributed it all to the Marrow. Having prevailed on its owner to part with the little book for its price, Boston lent the volume to friend after friend, till, at last, it fell into the hands of James Hog, of Carnock. James Hog of Carnock was one of the ablest divines, and one of the best preachers of his day, in Scotland, and, on reading the “Marrow,” the saintly scholar thought he saw his opportunity. Hog sat down and wrote a strongly-worded introduction to the hitherto unknown little book, and an enterprising and sympathising Edinburgh publisher put a Scottish edition of the “Marrow” upon the northern market; and the venture at once repaid both its editor and its publisher, for the “Marrow” was soon as well known in Scotland as the “Pilgrim’s Progress,” and the “Saint’s Rest,” and “Rutherford’s Letters”—and what more can be said about the best success of any book? And Chalmers’s reading of the Marrow was blessed to him, and his prayer was answered in the creation of the Free Church of Scotland, and in many other things that we see around us and before us in Scotland to-day. Read Dr. Chalmers’s Life by Dr. Hanna, and get your children to read it. The book is a masterpiece in literature, and its noble evangelical lessons cannot fail to impress, and quicken, and strengthen both the mind, and the heart, and the character of everyone who reads it. All ministers especially should have Chalmers’s Life by heart. YOU SEEM TO HOLD THAT HE CAME TO SAVE SUCH AS WERE NOT REALLY LOST. There was nothing that the Reformers in Germany and in Switzerland and the Marrow men in Scotland preached with more ability and eloquence and success, than just the particular and personal offer of Christ to every individual sinner. The Marrow men were very bold in this matter. They possessed a free and a full salvation in their own souls, and, in the name of God, they held out the offer of that same salvation to every man. Who are you? and what is your name? they demanded as they preached. Because we have a message from God immediately and personally to you. Is your name David in the matter of Uriah? Or Peter after his fall? Or Mary Magdalene, and she still possessed with seven devils? Or Saul still breathing out threatenings and slaughter? Is your name Luther the monk? or Bunyan the tinker? or Boston still in a half- converted state? You! they cried, singling out each individual hearer. Here is a sample of their fine pulpit work taken out of Walter Marshall, that great master in Israel, that perfect Euclid of evangelical sanctification, as I am wont to call him to myself. Oh! where are such masterly books as the Marrow? Is the Gospel mystery to be found again on every window-sill in Scotland and England as was once the case? “You are to be fully persuaded,” says Marshall, “and in your own particular case, that if you trust in Christ sincerely and perseveringly you shall have eternal life in Him, as well as the greatest saint in all the world. For the promise is universal, that whosoever believeth on Him shall not be put to shame. Conclude within yourself, then, that, howsoever vile and wicked and unworthy you may be, yet, if you come, you also shall be accepted. It is this that hinders so many wounded consciences and broken hearts from coming to the Great Physician. They are so dead in sin, they are so corrupt in heart, they are so without the least spark of any grace or goodness in themselves, that they think it to be nothing short of sheer presumption in them to expect to be saved. But why so? They can be but the chief of sinners; and is this not a faithful saying, and worthy of all acceptation, that Christ Jesus came into the world to save the chief of sinners? If they that are dead in sin cannot be saved, then all men must despair and perish; for no man has one spark of spiritual life in him till he comes for it, and receives it from Christ. Others think that they have outstayed their time, till there is no place of repentance left for them. But, behold, to every sinner still out of hell, now is the accepted time, now is the day of salvation.” And as Marshall and Fisher, following Luther and Knox, preached that personal, and individualising, and immediate Gospel of free grace, a great multitude of our own forefathers believed unto everlasting life. THE MARROW MEN EXCELLED THEMSELVES IN THE WAY THEY PREACHED THE ASSURANCE OF FAITH. Both in Germany, and in Switzerland, and in France, the full assurance of faith was splendidly preached in those first days of a recovered Gospel. And to acknowledge his sources, and to confess his indebtedness, and to assure his readers concerning his doctrine of the assurance of faith, the author of the Marrow actually gives his readers the names of some sixty-four theologians and preachers in all the Reformed Churches of Christendom, out of whose writings he had drawn this substance of his great evangelical dialogue. Now, what exactly is the assurance of faith? Well, it is, in short, just this—that all true faith has its witness in itself. All true faith is its own best evidence and surest proof. As thus—a minister preaches Jesus Christ and Him crucified to his people. He takes of the things of Christ and shows them to his people. And he pleads with them as an ambassador to be reconciled to God. The people listen; they attend; they begin to think; they begin to believe. One thing, another thing, many things, all work together to lead them to believe. A bad conscience, a bad heart, trials in life and losses, approaching old age, fear of death and judgment—all these things, under the hand of the Holy Ghost, work together till the people are led to rest all their trust and hope on the Lord Jesus Christ. And, already, as they begin to believe and trust and hope, the peace of God begins to be shed abroad in their hearts, and their minister’s Gospel preaching leads the people on from faith to faith, and from strength to strength, till they are able to certify and assure their own hearts, till the Holy Ghost is able to assure and seal their hearts, as He sealed and assured Paul’s heart, into this full assurance of faith. “I know in whom I have believed, and am persuaded that He is able to keep that which I have committed to Him.” And as faith grows, its full assurance will grow till the true believer is able to say with the Apostle, “He loved me, and gave Himself for me.” It is something not unlike this. A man loves a woman. He has long loved her unknown to her, till one day he takes her and opens his heart to her. She listens to him. She believes him, till her heart is carried captive to him. And from that great espousal day she has his promise, and he has hers. And from that day she has an assurance of his truth and his love that nothing will shake. Absence, distance, land and sea between her and him—her assurance only the firmer holds her heart. No news, bad news even; other lovers approaching her lonely heart—No! In all these things her faith, her full assurance of faith in her espoused husband, conquers all. Now, the believing heart is just like that. Nothing can ever pluck the true believer out of Christ’s hands, nor Christ out of the true believer’s heart. He may not be always sensibly near you. He may be away in a far country. He is away, but, then, He is away preparing a place for you. Then He will come again, and receive you to Himself. Therefore make yourself ready. Keep yourself ready. Have your lamp burning. Have your heart waking. For, at any moment, the shout may be heard in heaven. till his doctrine, and his life adorning his doctrine, made him what he became. For one thing, Boston was a true student all his days. He husbanded his time. He plied his books. He plied his pen. Like Goodwin, he studied down “his subjects, as a hunter starts and runs down his quarry.” My scarcity of books was a kind of providence to me, for it made me think out the thing.” “I plied my books” comes in continually. By plying his books he drove away headaches, and moroseness, and parish worries, and worse things, so he testifies. And both the substance and the style of his then classical, and still not unclassical, books was the reward of his incessant plying of his few great books and of his pen among them. In his pulpit “the salvation of the hearer was the one motive of the preacher. He always preached his sermon first to himself, and this made his preaching ever fresh, ever pungent, ever full of “sense.” As often as he got good in the preparation of his sermon, he argued from that that his people would get good next Sabbath. And all this made him feel keenly, as his preaching and pastoral life went on, “a preacher’s need of Christ’s imputed righteousness.” As to his pastoral work, he began it at home, and practised it every morning and every night upon his family. He prepared for the exercise, till this entry continually recurs in his diary, how he got this and that good this morning and this evening at the “exercise.” And then, on the same faithful principle, he catechised his parish twice in the year till “he found that he had enough to do among his handful.” “Yes, Simprin is small, but then it is mine.” And then, to seal all, Boston was a man of prayer, if ever there was one in a Scottish manse. “I consulted God.” He continually made that consultation, as a student, as a probationer, as a lover, as a husband, as a father, as a preacher, as an author, with the result that is to be read in his memoirs of himself and in all his works. And then, out of all that he became such a theologian also that Jonathan Edwards discovered him from New England and described him as “Thomas Boston of Scotland, that truly great divine.” As high a seal, surely, as this world could set, according to the Ciceronian principle, Laudari a viro laudato—to be so praised by a man whom everybody praises. Two truly great divines. Interestingly enough, both portraits are of the Rev. Thomas Boston. The latter looks nothing like the former, in my estimation. The first portrait is the frontispiece in A General Account of My Life, by Thomas Boston, A.M., Minister at Simprin, 1699-1707 and at Ettrick, 1707-1732 (London: Hodder & Stoughton, 1908). The second portrait comes from The Life and Times of Thomas Boston of Ettrick, authored by Andrew Thomson (T. Nelson & Sons, 1895). We are pleased to have Dr. David W. Hall with us today as guest author. Rev. Hall has served as the pastor of the Midway Presbyterian Church in Powder Springs, Georgia since 2003. 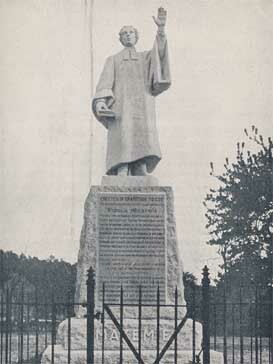 Prior to that, he was pastor of Covenant Presbyterian in Oak Ridge, Tennessee. While at Covenant, he was able to host an Internet-based magazine called Premise, one of the earliest Christian magazines to appear on the Internet. It began in 1994 and had a five-year run, ending in 1999. Twenty years ago! Ancient history, when speaking of the Internet! Premise was taken down off the Web quite some time ago, but the PCA Historical Center is grateful to have been able to preserve the magazine’s content. Dr. Hall’s article, which follows, is part of that content, and we hope to make more Premise articles available in the future. by Dr. David W. Hall. It was an ambitious plan to move four Presbyterian pastors and another 140 church members to the new world for religious freedom on a new ship specially built for crossing the Atlantic Ocean. That was the blessed hope and prayer of Scottish Presbyterians living in Ulster, yet under great difficulty from the Church of England. The four ministers—Robert Blair, John Livingston, James Hamilton, and John McClellan—were the spiritual leaders of the expedition. Their life and work in their congregations was being made more and more difficult. So through a letter to the Rev. Cotton Mather in New England asking whether Presbyterians could exist in that colony, and being assured that it could, plans were made. Off the coast of Newfoundland, the ship was hit with a mighty hurricane featuring “mountains of water.” Springing a leak, which was fixed, the rudder next broke. A brave passenger went over the side with a rope tied to him so he could be extracted. He fixed the rudder. After a discussion among the whole body, Pastor Livingston suggested that they should wait a day to see if God would give them smooth sailing. However when that delay didn’t accomplish their wishes, they turned around and sailed back to Ulster with smooth sailing. The first attempt to cross the ocean for Scot-Irish Presbyterians met with failure. But was it a failure? It is true, they did not get to their new place of ministry. But their presence back in Scotland strengthened the cause of Christianity. 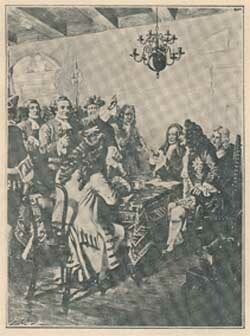 They became leaders in the new National Covenant of 1638. 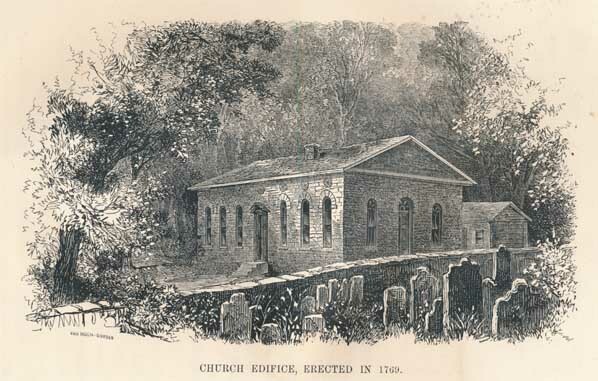 In Scotland and Ireland, they laid the spiritual foundation of that church which could justly claim to be the mother of the American Presbyterian Church. And after the lapse of a century or less, swarms of Scots-Irish sailed again and again to the shores of this new land, filling the colonies of Pennsylvania, Virginia, and the Carolinas, and beyond, with godly Presbyterian families.